Who Killed the Darling Buds of May? In 1997, we published the book, ‘Who Killed the Darling Buds of May?’. This seminal work brought together, for the first time, the scientific evidence to prove that vaccines are the biggest killer of companion animals today. 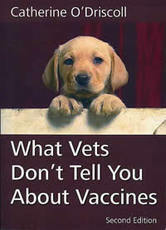 Revised and expanded in 1998 under the new title of ‘What Vets Don’t Tell You About Vaccines’, the book is now an official word-of-mouth best-seller. CHC members can be proud that their hard work contributed to the largest canine vaccine survey ever to be mounted – a survey that the veterinary establishment is still trying to ignore in order to protect vaccine income. CHC advocates the use of alternative healthcare for pets, including the homoeopathic vaccine alternative, natural flea and worm prevention, and a range of complementary therapies such as Bach Flower remedies, Chiropractic, Emotional Freedom Technique, Reiki, nutritional therapy, acupuncture, and more. Homoeopathic veterinary medicine has become increasingly popular since CHC started to promote it back in 1994, and we have led thousands of animals to the doors of homoeopathic and other complementary vets.